Over the last few weeks we have seen some pretty horrific accidents happen, all were preventable either by the rider or the driver. 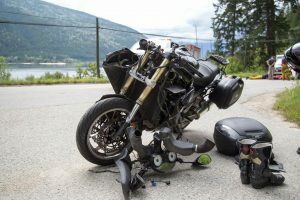 I had a first degree of separation to 3 of them and what struck me as odd is 2 of them occurred in British Columbia which is infamous for being motorcycle friendly. We are talking about people who purposely slow down and pull over before you enter the twisted parts to let motorcycles ahead of them. Yet I am going to share a couple stories that all transpired in a 15 day span. These stories are being shared with permission as a learning tool for riders to be aware. "So as a few of you know, I will now let the rest of you know that while entering Invermere last week on my way to The Horse Thief Hideout rally, I was hit by a left hand turner in a Dodge truck with no chance to react. I was unconscious until they were loading me into the ambulance but I knew exactly why I was be loaded. Broken face is recovering (stitches out). Tongue won't go down from three times its normal size as I bit so hard. Could be weeks. Knee cap and Femur broken but screws inserted and rebuilt. Right wrist broken in a rare place so surgery later this week will hopefully fix that. Bruises where nobody should have them and drugged up but still feeling too much pain. I will survive with the help of family and friends but it's going to be a long tough haul. I will also ride again one day (bike was totalled though) but I urge everyone out there to please be safe on the road and be aware. Not just of motorbikes but all your fellow drivers. Take care & be aware. This was my third serious bike accident in the 42 years of riding and none were my fault. I'm hoping it doesn't happen again but it seems to be out of my control." To say I am grateful to find my friend in such good spirits is an understatement. He even joked that the score was now Invermere 2, him 0. The inside part of that joke is that a couple years ago he was with our friend who first informed me of this accident when they struck a deer. Looking at his overall stats, 42 years of riding with 3 major accidents, one might say he is lucky. He will heal and get back on a bike again and for that we are all thankful. 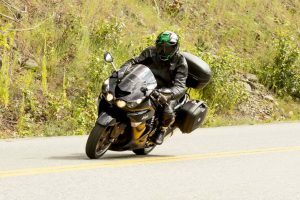 On July 15, there was a group ride heading out in the Kootenay area from the annual Kootenay Rat Raid, an event geared towards Triumph Riders. This event has been going on for now 14 years and near and dear to my heart. Part of the Friday group ride includes a photography session out on the 31A as we have a professional in the group. But before we set out, I always do a safety talk with the group about riding to your means, the possible dangers on the road and where we will be stopping to let the riders at the back catch up. This is done every single time a group goes out because sometimes those reminders are needed or new people need a heads up. We were on our way back in from the ride, not 10 minutes out from Nelson, our home base. I was the third bike in the group and the three of us were a bit ahead of the rest. I was about a second behind rounding the corner and all I saw was my friend lying in the road, his bike shattered into pieces and a car hanging off the edge of the road. A vehicle pulled an illegal u-turn over a double solid yellow in front of my friend and he had nowhere to go. Because he has done many track days and rider training, he instinctively reacted by putting the bike down and pushing away. Because he wears all of his gear, he ended up walking away with some soreness and major bruising. He was back on a bike 2 days later. The two pictures in this section where taken literally 2 hours apart. It's amazing how quickly one poor judgement can turn a fun day in to a highly stressful one. Thankfully my friend wasn't seriously injured in this case and it was a great reminder to always grow your skills so you can calmly react in the face of something out of your control for the best possible outcome. On July 23 I was supposed to be on a group ride with a group of friends and new friends. I was detained because of another commitment in the morning with all intentions of catching up for a fun day in the sun at Sylvan Lake. I was updated that the group was leaving Pigeon Lake with an ETA at Sylvan of 1:30. Shortly after that notification, I received a call that I was never prepared for...there was an accident and it included at least one fatality. I immediately hopped in my car and another friend followed behind with a trailer. I knew there would be some affected to the point that they would not be able to ride home and we needed to ensure we could get everyone home safely. When I arrived on scene it was unlike anything I have ever seen. There were motorcycles everywhere. The injured were already taken to the hospital, the group were all together supporting each other. RCMP confirmed that a truck slammed in to the back of an SUV who had slowed to turn left and was pushed into the group of riders passing by in the oncoming lane. There was nothing they could have done in that case, it was just that quick. The group is now coping as well as they can all things considered and have pulled together in a show of support that includes the family of the rider we lost. It's powerful what tragedy can do in pulling people together. All three of these cases had their own level of scary. All three were completely preventable. So the message to take from this is simple...take care of each other, watch out for each other. Whether you are on a bike or in a car, your focus should be 100% on being responsible on the roads and sharing them safely. It seems out on the highways this year, the dangers have increased. We have heard of many accidents where vehicles are pulling out right in front of riders at the last moment. We have lost some and others have been injured to the point of forever life changes. Be aware of vehicles at highway intersections, they don't seem to see us. Watch the wheels of the cars coming at you, that is a tell tale sign of direction. Be cautious and be aware so we can all get home safely. The only person you have complete control over if yourself. On behalf of the AMSS, we wish all of our friends a speedy recovery, some will require more patience than others but they will heal. To the family and friends of not just the rider we lost in the recount above, but to all we have lost this season, our deepest condolences.